Back in 2000 when I heard for the first time of economic bubbles the dot com bubble was bursting out. At that time the theory remained in the informational side of things for me. Some years later after seeing the real state bubble boom and naturally later on burst things started clicking in more into the experience field of things. 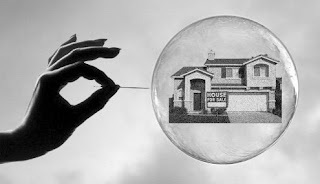 Since I saw the housing bubble burst I started wondering what the next bubble would be. Now, if I had to bet, I'd have no doubt in my mind. The next bubble is about "alternative" energy sources. With gas prices going up insanely (which does not worry me as I started carpooling and my gas price reduced to one third of its original value) the bubble is already booming. Next thing we know, all those alternative sources will become sustainable, investment on those will grow, people and companies will bet on different ones, some will make it ... the old gold story, those who build infrastructure: products and services around alternative energy sources will hit the pot. Now that I was googling for something related to this subject I found an article stating this same thing (in a much nicer way). My next thought is that bubbles are a natural phenomenon that happens due to network characteristics and they sure have much more global properties beyond economy (as in social networks, neural networks, etc). It was a very strong experience to watch the housing market offer and demand act in the local area of Temecula, California for the last year or so. The first thing you could observe was the obvious, houses with high prices were not selling as there is more offer than demand. But, later on, to my great surprise, we started seeing that houses that were priced under market would experience a process like a silent auction until they would reach very close to market price. I used to have this illusion that bubbles were artificially created and controlled by a few people, but now I think of them as self-regulated networks presenting common emergent properties.